1.500 Swazi workers marched in Swaziland’s capital Mbabane on Thursday (25 February 2016), as part of a two-day strike action, where they delivered a petition to Prime Minister Barnabas Dlamini demanding increased salaries for public sector workers, writes Kenworthy News Media. The march was part of a six-month-long demand by Swazi trade union federation TUCOSWA for the government to release a salary review report that highlights working conditions of public sector workers across the country. The salary review report is supposed to be released every 5 years, to ensure that the level of salaries keeps up with inflation, but no report has been released since 2004. The lengthy report was finally released on Wednesday by local firm LCC Capital Consulting after the government had initially said it contained “confidential” information and was not for public consumption. According to local newspaper Times of Swaziland, the report proposed a salary increase for civil servants of between 18 and 40 percent. According to the movehub.com website, the average salary in Swaziland is US$4,827 compared to $19,215 in neighbouring South Africa, $7,591 in neighbouring Mozambique, $37,029 in the United Kingdom and $72,328 in Norway. Two thirds of the population of Swaziland survives on less than a dollar a day, and an ongoing drought in the country has further destroyed the livelihood of many Swazis. At the same time the Swazi government has recently spent an estimated US$250 million on a new international airport and plans to buy new cars for visiting heads of state and government when Swaziland hosts the Southern African Development Community (SADC) meeting next year. Swaziland’s government and Prime Minister, as well as part of parliament and the entire senate, is handpicked by the country’s absolute monarch King Mswati III. Thursday’s march was peaceful, unlike many previous union and other marches in Swaziland, where police often used force to intimidate or disperse demonstrators. Perhaps this was because Swaziland’s 5000-strong police force ought to receive a US$3 million salary rise, according to the report. TUCOSWA Deputy Secretary Mduduzi Gina said he was sympathetic towards the plight of police officers and warders, and that the government ought to consider their welfare, along with that of Swazi civil servants in general. The marching civil servants were supported by a number of other organisations, including the Swaziland United Democratic Front (SUDF), an umbrella organisation of all progressive democratic forces in Swaziland. “Thousands of workers are marching. SUDF supports these public sector workers as they push for better salaries”, said SUDF coordinator Wandile Dludlu, who himself took part in the march. This is the picture that demonstrates the true power of King Mswati III, the absolute monarch of Swaziland. It shows the President of the Swazi Senate Gelane Zwane on her knees before the King. 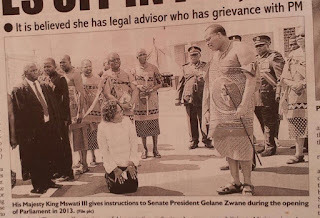 According to the caption of the picture which first appeared in the Times of Swaziland newspaper, King Mswati ‘gives instructions’ to her ahead of the opening of Parliament in 2013. The people do not elect a government. The Prime Minister and Cabinet ministers are appointed by the King. Only a man with the surname Dlamini can, by tradition, be appointed as Prime Minister. The king is a Dlamini. King Mswati III’s absolute monarchy in Swaziland ‘ultimately is incompatible with a society based on the rule of law’, a report into the kingdom’s judicial crisis has concluded. Swaziland’s Constitution must be amended to bring it in line ‘with regional and universal international law and standards, in particular on the separation of powers and respect for judicial independence,’ the report called Justice Locked Out: Swaziland’s Rule of Law Crisis said. It was published by the International Commission of Jurists on 18 February 2016. Only weeks after Swaziland’s absolute monarch King Mswati III told his subjects the drought in his kingdom was over, his government has declared a national emergency. King Mswati had said the drought was over when his regiments took part in the Incwala ceremony. The Swazi Observer, a newspaper in effect owned by the King, reported on 1 January 2016 that the King had ‘pronounced an end to the drought situation’. The newspaper added, ‘As he pronounced an end to the drought situation, the King predicted a bumper harvest and urged all Swazis to go and work hard in their fields. But King Mswati’s complacency has led to a devastating delay in taking action. Swaziland is now at crisis point. Barnabas Dlamini, the Prime Minister of Swaziland who was personally appointed to his post by the King, officially declared a national emergency on Thursday. He said over the next two months the Swazi Government would need E248 million (US$16 million). In total, government would need about E2 billion to address the situation over five years, the Times of Swaziland, the kingdom’s only independent daily newspaper, reported. The Prime Minister did not say where the money would come from. Only last week (18 February 2016) King Mswati, who rules Swaziland as sub-Saharan Africa’s last absolute monarch, ordered the government he hand-picked to slash budgets as the kingdom faced a financial crisis following a reduction in receipts from the Southern African Customs Union. Swaziland, where political parties are not allowed to contest elections and groups campaigning for democracy are banned as ‘terrorist’ organisations, is to seek financial aid from overseas – mostly from multi-party democracies. EU Ambassador to Swaziland Nicola Bellomo said the kingdom immediately would seek E143 million from the ‘donor community’. He said the EU would support the government's efforts to mitigate the impact of the drought situation. There is no oversight on how Swaziland’s King Mswati III, his fourteen wives and vast royal family spend public money, a United States report concluded. The US makes annual reviews of the ‘fiscal transparency’ of governments that receive its financial assistance to ensure that American taxpayers’ money is used appropriately. In its review of Swaziland published in June 2015 the US Department of State concluded the kingdom, ruled by King Mswati, who is an absolute monarch, did not meet acceptable standards. The truth about of the King’s spending has been consistently hidden from the Swazi people, his budget is never debated in parliament, and audits of the budget are only presented to the King himself and the Royal Board of Trustees chaired by the minister of finance. Media in Swaziland have access to the full budget estimates which contain information about the King’s budget but do not publish it. State media in the kingdom are heavily censored and the private media censors itself when reporting about the King. Despite the poverty of the kingdom, King Mswati continues to live a lavish lifestyle. He has 13 palaces, fleets of top-of-the-range Mercedes and BMW cars, at least one Rolls Royce and a private jet.